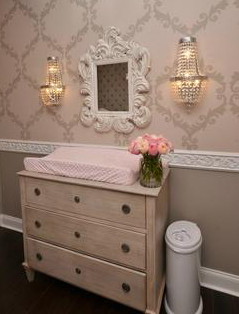 Kennedy's pink and gray princess nursery theme includes features that I've always admired in 18th century rococo interior design. Her room is decorated with the style's whimsical curves and fine details in soft feminine colors. I took great care in this decorating project to evoke an atmosphere of happiness and creativity. elegant baby cribs with tufted upholstery for your nursery decorating project. The headboard and foot board of the white-washed crib is upholstered in dove grey fabric that has been tufted. I chose a simple, white baby bedding. The white linen color is perfect to showcase and not take away from the elegant design of the crib. 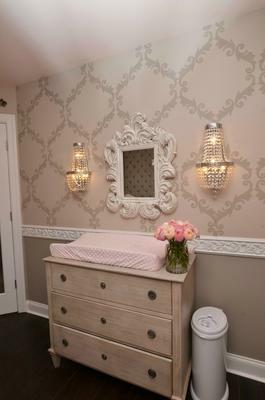 My baby girl's nursery is lit with a small chandelier that features a pink, silk cord cover and is highlighted by an ornate ceiling medallion that was painted white. I added additional lighting to the room with matching crystal wall sconces. Drawing from the tufting featured in several pieces of furniture in my home, I was inspired to tuft the entire back wall of the nursery in a delicate grey linen. When designing the nursery I was inspired by my goal of "delicate perfection" and the feeling that I get from viewing examples of rococo design for my first-born daughter's room. The first order of business was to personalize the space. In addition to spelling her name on the nursery wall, I hung a 4-foot letter "K" (her first initial) from the ceiling in front of the tufted wall. The perimeter of the room features a stylish, wooden chair rail with a scrolled design that I found on an online website. First, I painted the large, wooden letter with white paint and then, while the paint was still wet and tacky, I covered it with cotton balls to soften the look. You can't see it very well in my baby girl's nursery pictures but it looks amazing and was a very easy craft project unlike so many crafts that are expensive and difficult for beginners. I used the color grey and pink as the primary nursery color scheme. I used varying shades of grey accented with a delicate, pastel pink. The ceiling as well as the walls are painted petal pink and the carpet was replaced with a dark walnut hardwood to give the room a feeling of depth. Delicate floral petals are woven throughout the area rug that extends under the crib. 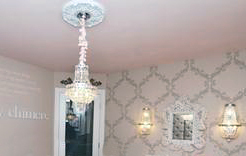 The rococo style is further captured in the hand-stenciled accent wall, which displays a continuous, ornate diamond pattern that reflects the diamond pattern of the tufted wall. I also used my stenciling skills to paint my favorite Psalm that speaks of the wonders of birth above the antique grey-washed bassinet, using a soft, petal pink paint color. 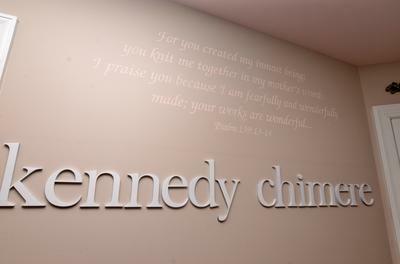 Beneath the stenciled pattern, I hung lower-case wooden letters. I used all lower case letters for a delicate understated look. I accented the double window with hand-painted wooden drapery rods and handmade, white silk dupioni drapery trimmed with "pink puff" trim. Adorning both sides of the window are picture frames that I spray painted white and screwed a hook into to make a "picture perfect" arrangement using two vintage infant gowns. In order to always have the baby in sight without disturbing her, I replaced the solid wood door of the nursery with a single pane glass door. Above the door, I placed a silver accent piece to add pizzaz. Overall, the room is fit for a princess! 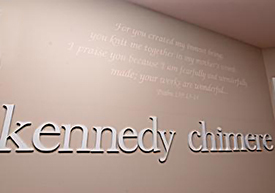 Kennedy is one lucky baby girl to have such a talented mom and such a lovely room to grow in. Could you please direct me to a tutorial for tufting the walls? I would really like to try this DIY decorating technique. Love Love Love this nursery. Thank you for sharing your beautiful ideas with us. I would like to know where you found the crystal wall sconce --- we have looked everywhere for affordable ones. Your information would be greatly appreciated. Where can I buy the wallpaper? I am in love with this room.